o and as an option, ASR. In off-road mode you can switch off the ABS so as to allow the wheels to lock (up to a maximum speed of 15km/h) - which is especially useful for tackling steep gradients with low grip. As soon as you exceed 15km/h, the ABS switches back on automatically. The ABS (Anti-lock Braking System) prevents the wheels from locking during braking, regardless of the condition of the road surface. Signals from the ABS sensors mounted on the wheels provide precise information about the behaviour and reactions of each wheel during braking. The ABS is therefore capable of reducing braking force immediately before one or more wheels locks. If the state of the road surface allows sharper braking, the ABS increases the braking force again, up to the limit of grip. 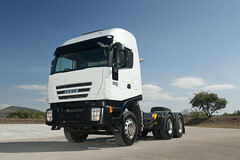 The New Trakker is equipped with EBL (Electronic Brakeforce Limitation) for optimising braking force according to load. The signals sent by the ABS sensors provide all the necessary information about the behaviour and reaction of the individual wheels during braking. It is therefore possible to calculate the actual distribution of the load between front and rear axle, and calibrate the braking pressure on each axle in real time according to current conditions. The ASR (Anti-Slip Regulation) system uses the same type of signals as the ABS to prevent the drive wheels from slipping and to increase traction during acceleration. o and reduces tyre wear. With ASR, the drive wheels benefit from the best possible traction even in difficult conditions, such as steep gradients and slippery surfaces.